^ XVIII Airborne Corps Desert Storm Chronology 24–28 February 1991. United States Army Center of Military History. [2008-12-18]. Bishop, Chris. The Encyclopedia of Tanks and Armored Fighting Vehicles: From World War I to the Present Day. San Diego, CA: Thunder Bay. 2006. ISBN 978-1-59223-626-8 （英语）. Caiti, Pierangelo. Modern Armour — The world's battle tanks today. London: Arms and Armour Press. 1978. ISBN 0-85368-412-X （英语）. Chant, Cristopher. World encyclopaedia of the Tank — An international history of the armoured fighting machine. Somerset: Patrick Stephens Limited. 1996. ISBN 1-85260-114-0 （英语）. Cogan, Charles. The Third Option, The Emancipation of European Defense, 1989–2000. Westport, USA: Praeger. 2001. ISBN 0-275-96948-7 （英语）. Cordesman, Anthony H.; Burke, Arleigh A. Saudi Arabia Enters the 21st Century: The Military and International Security Dimension, IV. The Saudi Army. Center for Strategic and International Studies. 30 October 2001. ISBN 978-0-275-97997-3 （英语）. Crow, Duncan; Robert J. Icks. 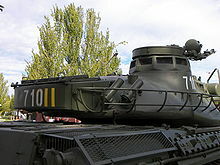 Encyclopedia of Tanks. London, United Kingdom: Barrie & Jenkins. 1975. ISBN 0-214-20080-9 （英语）. de Mazarrasa, Javier. Blindados en España 2ª Parte: La Dificil Postguerra 1939–1960. Valladolid, Spain: Quiron Ediciones. 1994. ISBN 84-87314-10-4 （西班牙语）. de Mazarrasa, Javier. 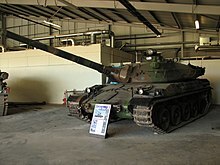 Carro de Combate AMX-30E. Aldaba Ediciones. 1990. ISBN 84-86629-29-2 （西班牙语）. Dunstan, Simon. 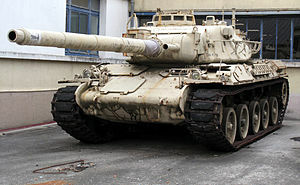 Chieftain Main Battle Tank 1965–2003. Osprey Publishing. 2003. ISBN 978-1-84176-719-2 （英语）. Ferrari, Giorgio. The "Hows" and "Whys" of Armour Penetration. Military Technology (Moench Verlagsgesellschaft Mbh). October 1988, (10/1988) （英语）. Foss, Christopher F. Jane's World Armoured Fighting Vehicles. Macdonald and Jane's Publishers Limited. 1976. ISBN 0-354-01022-0 （英语）. Foss, Christopher F. Jane's Main Battle Tanks — Second edition. Jane's Publishing Company Limited. 1986. ISBN 0-7106-0372-X （英语）. Foss, Christopher F. Great Book of Tanks: The World's Most Important Tanks from World War I to the Present Day. Zenith Press. 4 January 2003. ISBN 978-0-7603-1475-3 （英语）. Foss, Christopher F. Jane's Armour and Artillery, 2005–2006. Jane's Information Group. 2005. ISBN 0-7106-2686-X （英语）. Foss, Christopher F. Jane's Tank Recognition Guide. London, United Kingdom: Harper Collins. 2006. ISBN 978-0-00-718326-5 （英语）. Gelbart, Marsh. Modern Israeli Tanks and Personnel Carriers 1985–2004. Oxford, United Kingdom: Osprey. 2004. ISBN 1-84176-579-1 （英语）. Hilmes, Rolf. Battle Tanks for the Bundeswehr: Modern German Tank Development, 1956–2000. Armor (Fort Knox: US Army Armor Center). January 1, 2001, (January–February 2001). ISSN 0004-2420 （英语）. Jerchel, Michael. Leopard 1 Main Battle Tank 1965–1995. Oxford, United Kingdom: Osprey. 1995. ISBN 1-85532-520-9 （英语）. Jeudy, Jean-Gabriel. Chars de France. Boulogne: E.T.A.I. 1997. ISBN 2-7268-8369-9 （英语）. Lathrop, Richard; John McDonald. M60 Main Battle Tank 1960–91. Oxford, United Kingdom: Osprey. 2003. ISBN 1-84176-551-1 （英语）. Mercillon, Patrick H. Les Chars Français du Musée des Blindés. Saumur: Centre de Documentations sur les Engins Blindés （法语）. Miller, David. The Illustrated Directory of Tanks and Fighting Vehicles: From World War I to the Present Day. Osceola, WI: MBI. 2000. ISBN 978-0-7603-0892-9 （英语）. Ogorkiewicz, Richard M. AMX-30 Battle Tank. Berkshire, United Kingdom: Profile Publications Ltd. December 1973. OCLC 54349455 （英语）. Perez-Guerra, Jaime. Spanish AMX-30 MBT upgrade program. Janes International Defense Review (Janes). 1 April 1987 （英语）. Perrett, Bryan. Iron Fist: Classic Armoured Warfare Case Studies. London, United Kingdom: Brockhampton Press. 1995. ISBN 1-86019-954-2 （英语）. Rottman, Gordon. Armies of the Gulf War. Oxford, United Kingdom: Osprey. 1993. ISBN 1-85532-277-3 （英语）. Rudnick, David. Atlantic Relations: Policy Co-ordination and Conflict (The Case of the Leopard Tank). International Affairs (London, United Kingdom: Royal Institute of International Affairs). April 1976 （英语）. Scales, Robert H. Certain Victory: The U.S. Army in the Gulf War. Washington DC, USA: Brassey's. 1998. ISBN 1-57488-136-1 （英语）. Senger und Etterlin, Ferdinand von. Tanks of the World — Taschenbuch der Panzer. Koblenz: Bernard & Graefe Verlag. 1990. ISBN 3-7637-5871-2 （英语）. Spielberger, Walter. 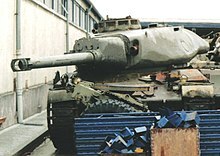 Von der Zugmachine zum Leopard 2 — Geschichte der Wehrtechnik bei Krauss-Maffei. München: Bernard & Graefe Verlag. 1980. ISBN 3-7637-5203-X （德语）. Westermeyer, Paul W. U.S. Marines in Battle: Al-Khafji, 28 January – 1 February 1991 (PDF). Washington D.C., United States of America: History Division, U.S. Marine Corps （英语）. Zaloga, Steven J. Modern Soviet Armor: Combat Vehicles of the USSR and Warsaw Pact Today. Edinburgh, United Kingdom: Prentice Hall. 1979. ISBN 0-13-597856-4 （英语）. Zaloga, Steven J. The M47 and M48 Patton Tanks. Oxford, United Kingdom: Osprey. 1999. ISBN 1-85532-825-9 （英语）. Zaloga, Steven J. T-54 and T-55 Main Battle Tanks 1944–2004. Oxford, United Kingdom: Osprey. 2004. ISBN 1-84176-792-1 （英语）.